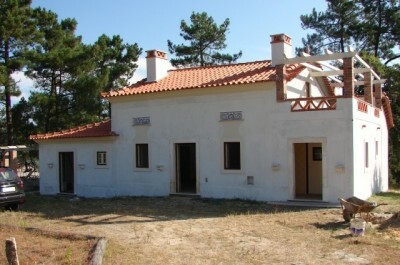 A four bedroom detached house in the process of being restored for sale close to the town of Ourem in central Portugal. The house, which is set over two floors, is fully double glazed and is connected to mains water and electricity. The house, which measures 160 square metres of construction is set on a plot measuring 1,500 square metres. The house is in the final stages of restoration . The house has been restored to include as many as possible, utilising traditional materials. Ground Floor: The main entrance to the house leads directly into a spacious living room. The exterior door is aluminium framed and is double opening to emulate the original. The living room has a traditional ceramic tiled floor and is double aspect. There is a corner staircase off the living room which leads to the first floor accommodation. Off the living room, via an archway there is a partially tiled kitchen. This kitchen also has an exterior access door, with a glazed panel, which leads to the front of the house. The kitchen is spacious and has a ceramic tiled floor. There is a decorative archway off the kitchen which leads into a spacious dining room, which has an exposed wooden beamed roof. This dining room also has a large, traditional fireplace to one end and an exterior access door which leads out to the rear of the house. There are three bedrooms to this floor, with ceramic tiled floors and built in wooden wardrobes. One of these bedrooms is en-suite. The en-suite bathroom is fully tiled and has a shower, toilet, bidet and vanity basin. There is also a family sized bathroom to this floor, which is also fully tiled. The family bathroom has a bath with shower above, toilet, bidet and vanity basin. There is also a fully tiled laundry room to this floor which also has an exterior access door leading to the rear of the house. First Floor: There is a master suite to the first floor. This master suite bedroom is double aspect and has an exterior access door, which leads out to a private veranda with good views over the countryside. The veranda has a gazebo roof and a ceramic tiled floor. The bedroom is spacious and has a tiled floor. The en-suite bathroom is fully tiled and will have a shower, toilet, bidet and vanity basin. To one end of the house there is a shaded exterior dining area. The property is set on a plot measuring 1,500 square metres, which is all relatively flat. There are some mature trees including olives on the land. The property is detached and set back from a quite road. There is a neighbouring property nearby, however there is sufficient distance between for complete privacy. The property is situated close to the village of Alqueidão in central Portugal. The village of Alqueidão has several cafes and a small mini-market and is only an eight kilometre drive from the town of Ourem. Ourem has several large supermarkets, shops, restaurants, banks, schools, pharmacies, health centres, builders merchants and an historic castle. The larger, historic town of Tomar, which is home to the UNESCO listed Convento do Cristo, is only 13 kilometres from the property. Tomar is a popular town with a quaint historic centre with cobbled streets. There are a variety of shops, restaurants, hotels, cafes, banks, supermarkets, parks, sports centres and schools within the town. The closest airport to the property is situated at Lisbon, which is approximately 146 kilometres away. Lisbon airport is serviced by several low cost airlines which operate regular flights into and out of the United Kingdom and other European countries..